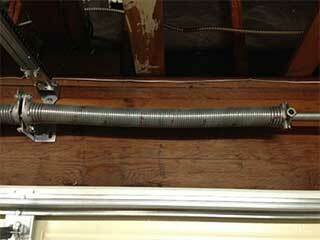 One of the most overlooked parts of your garage door system are the springs. They have the responsibility of supporting the weight of the door and helping it move. Without proper maintenance and timely replacement these components will become compromised and the system will ultimately fail unexpectedly, which can be incredibly dangerous. There are two different types of springs that are used, and they both need to be maintained on a regular basis. Extension springs are installed in pairs, one on each side of the door. They build up tension as the door lowers and then use that tension to lift the door back up. In comparison, when torsions springs are used, usually only one unit is installed, unless the door is extremely heavy. Components of this type utilize torque in order to the lift the door. Of the two types, extension units are the ones most likely to break down first and will therefore last for a shorter time. They are also more dangerous as they are far more likely to go flying when they break, which is why safety cables are often used to keep them in place in case that happens. One of the easiest ways to keep the stability of your system is to have regular spring maintenance performed by our highly specialized technicians. As these components age, they will begin to rust and break-down due to the regular wear and tear they go through. Eventually, they will become a safety risk to you and to anyone who steps foot inside your garage. During a maintenance appointment, our technicians will inspect the condition of these components, and apply them with the proper lubrication material that will keep their performance smooth and efficient. We'll also adjust their tension to make sure the amount of stress put on their coils is precise and that the door doesn't get unbalanced. Many garage door owners believe they are equipped to handle any need their system may have. Unfortunately, if a spring breaks while you're trying to replace it, you or anyone standing nearby could get severely injured. Even the task of spring adjustment can be dangerous, which is why we highly recommend that you always contact our team when you need any type of spring-related services. You can rely on our highly skilled experts at Garage Door Repair Murrieta to provide you with anything from regular maintenance to emergency spring replacement. Call us today!